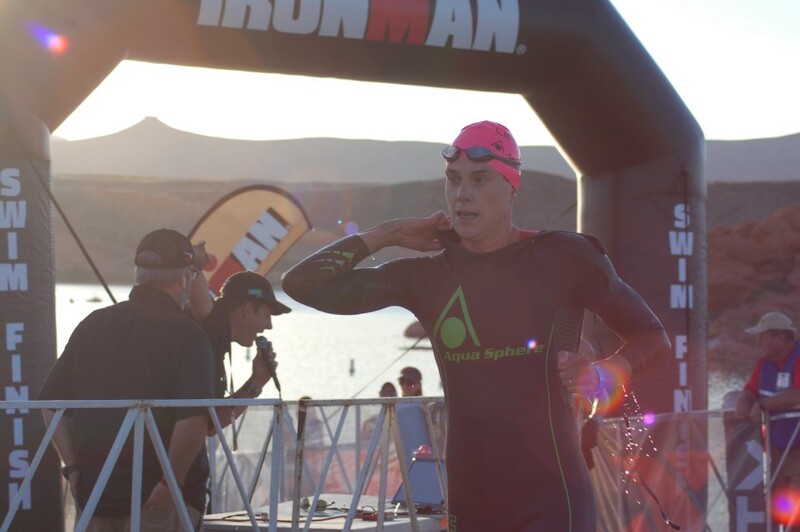 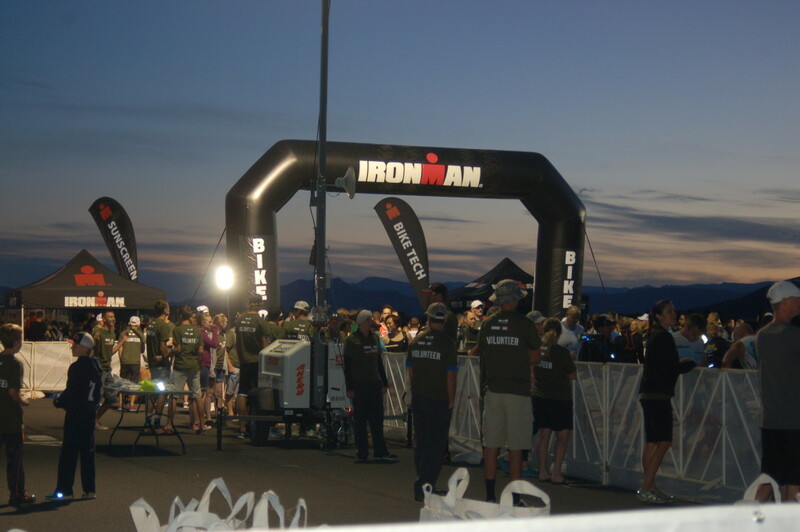 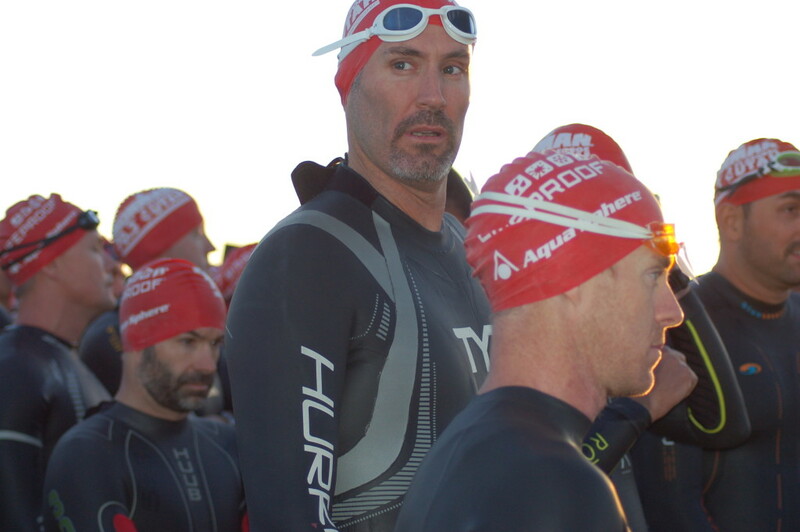 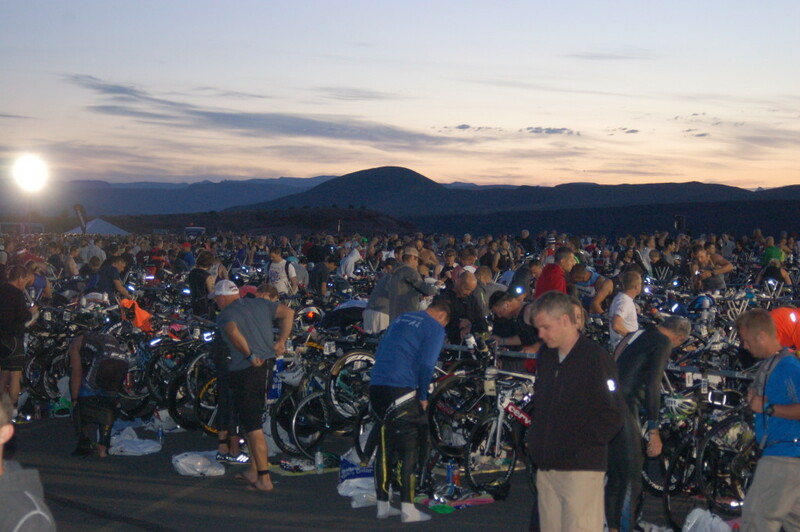 HURRICANE – The smell of sunblock permeated the air in the dawn hours Saturday as thousands of triathletes prepared to hit the water at the start of the Ironman 70.3 St. George. 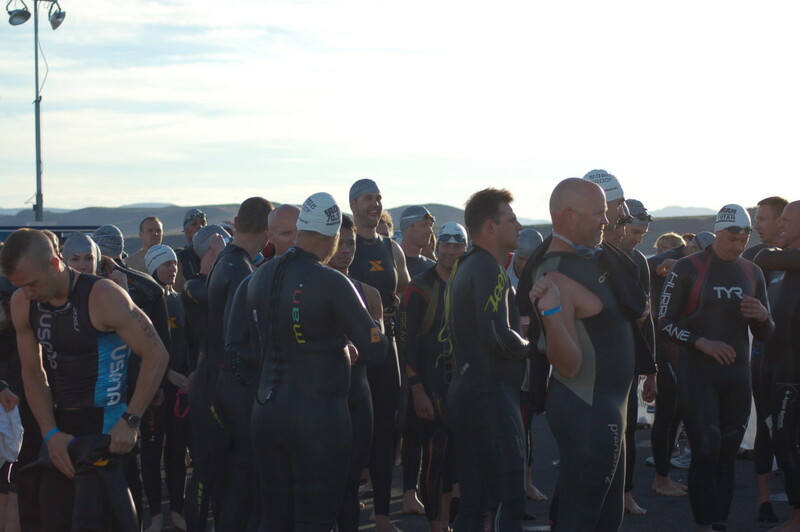 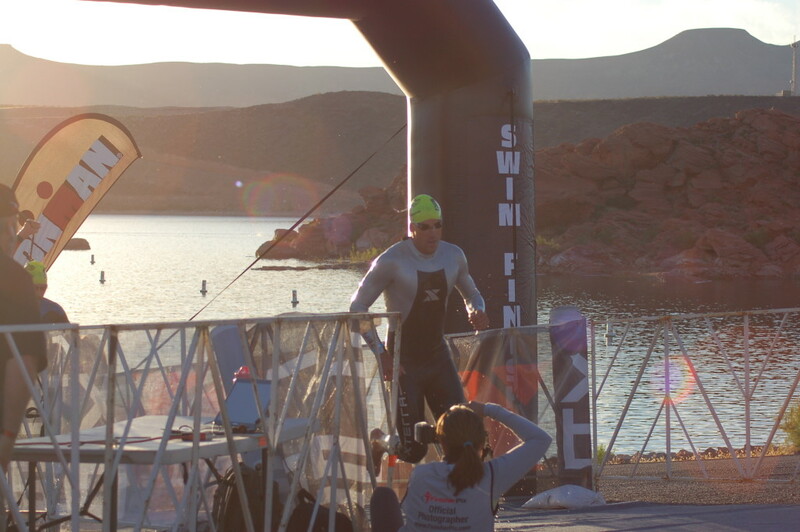 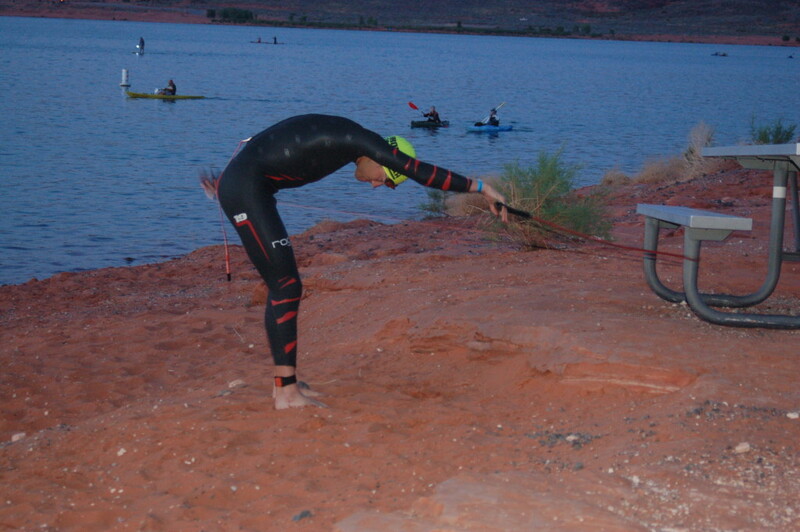 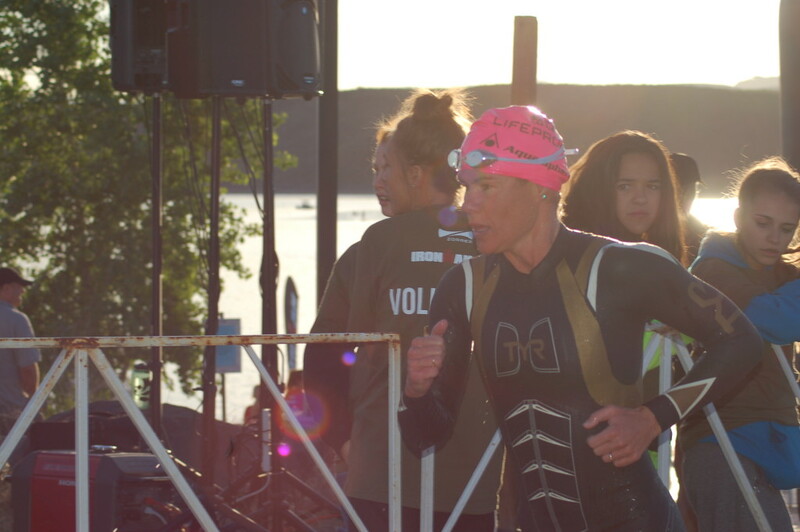 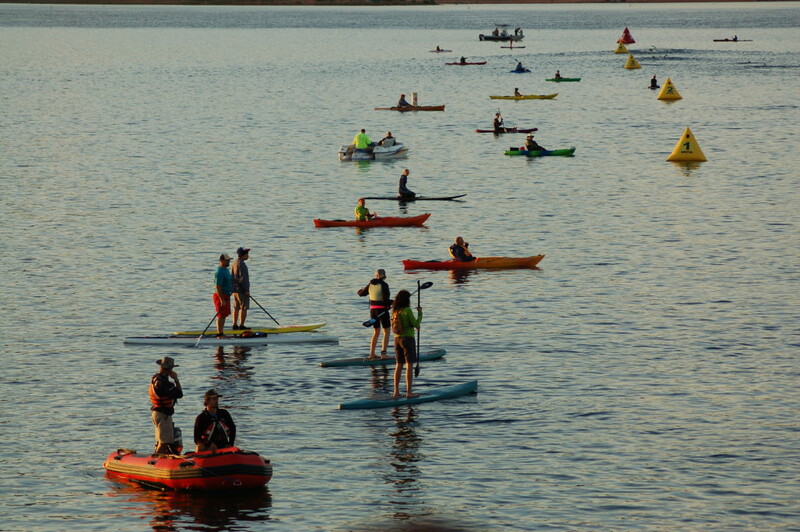 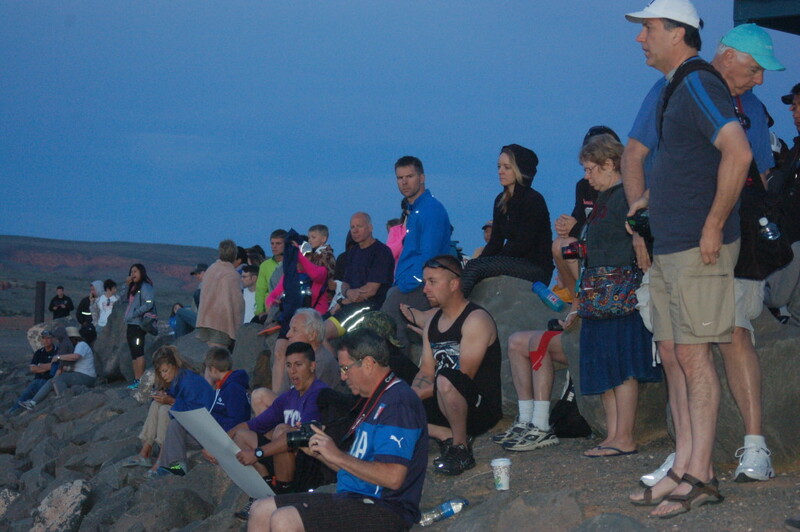 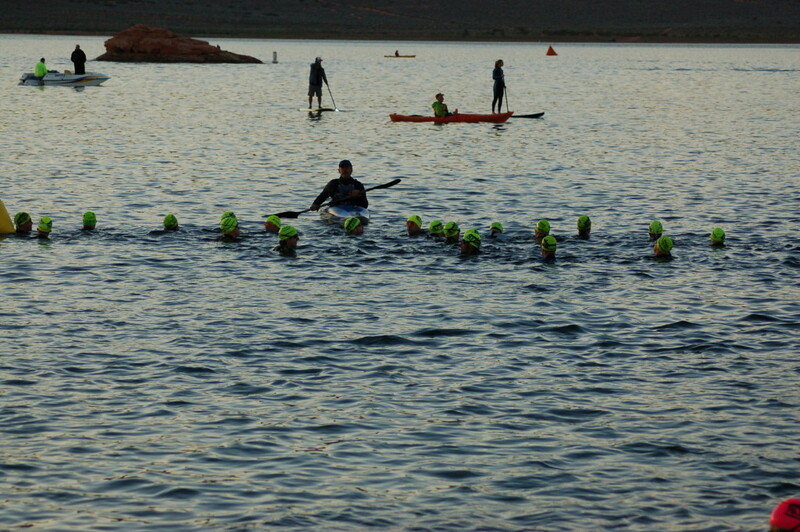 Athletes, spectators, race staff and volunteers filled the parking lot of Sand Hollow State Park with a tangible energy well before the sun crested the eastern cliffs that provided the dramatic backdrop for the swim. 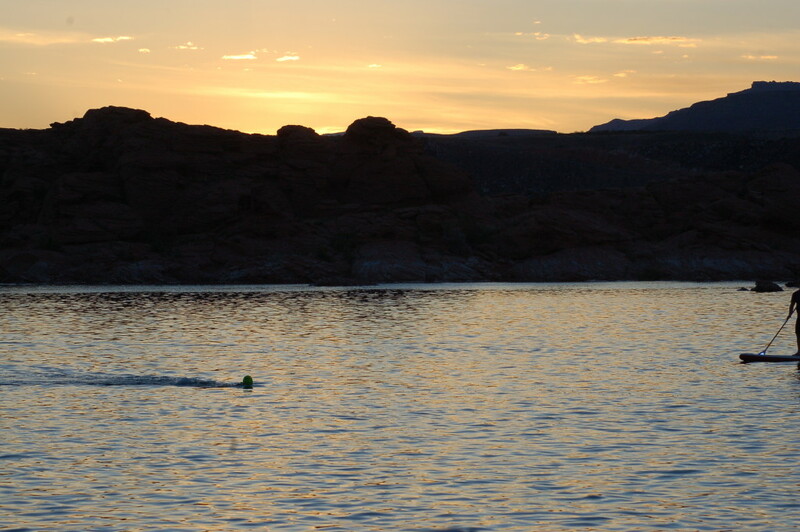 The calm waters of Sand Hollow Reservoir were dotted with buoys marking the 1.2-mile long swim course and boats, kayaks and stand-up paddleboards were staffed and ready to provide support to swimmers. 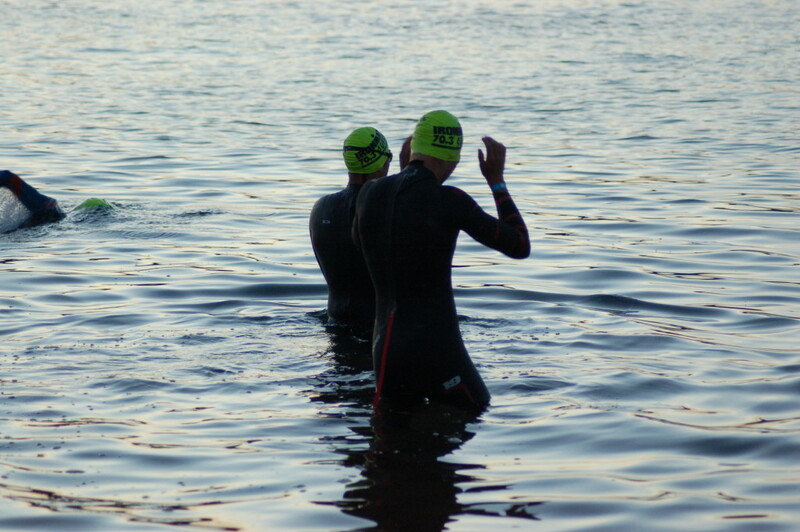 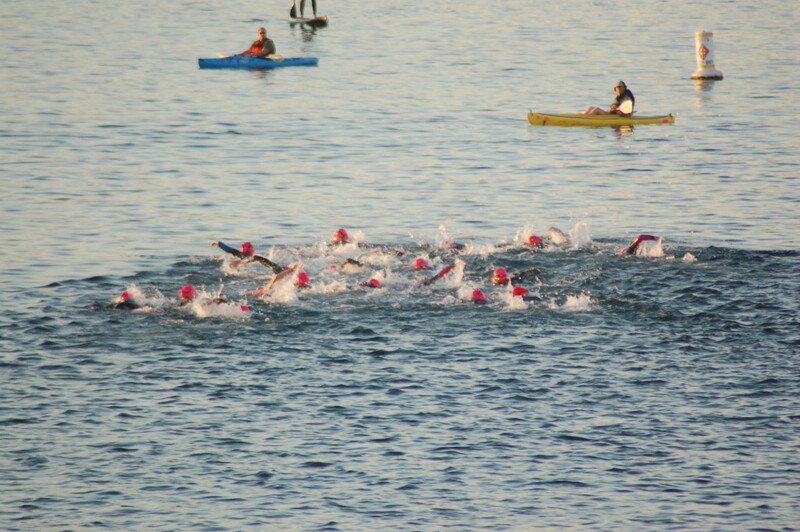 Approximately 20 minutes before race start, the professional men and women were allowed into the water to warm up. 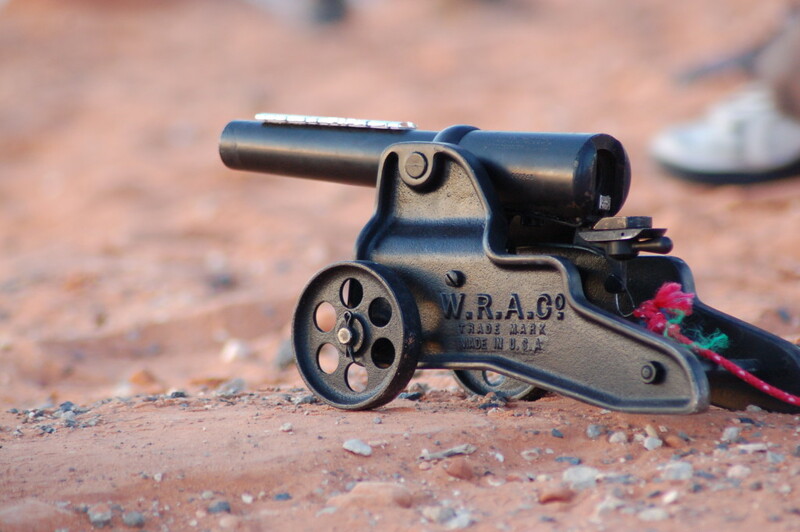 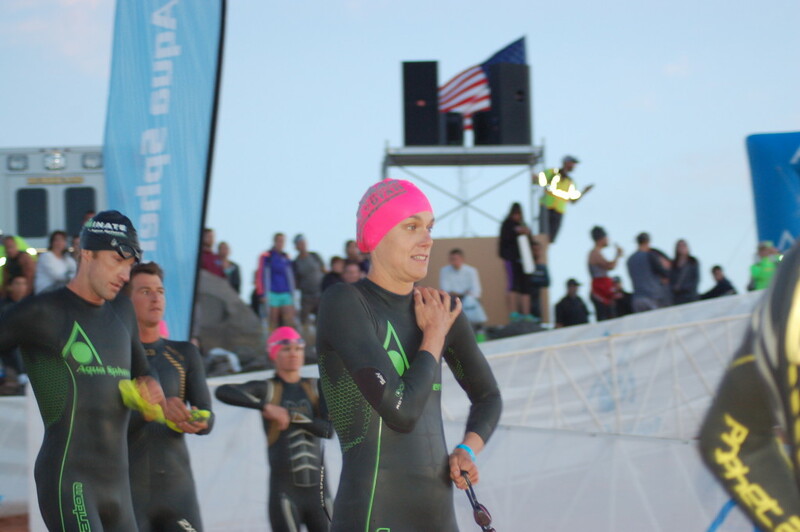 Following the national anthem a cannon blast signaled the start and the professional men were off followed shortly by the professional women. 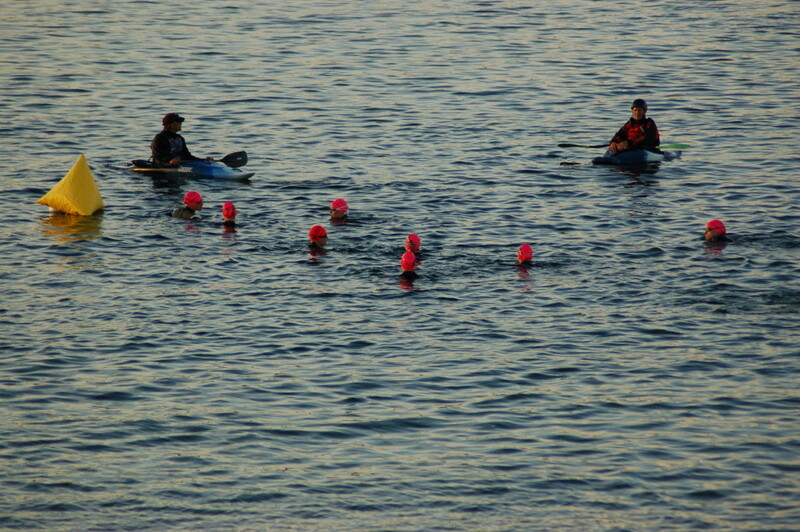 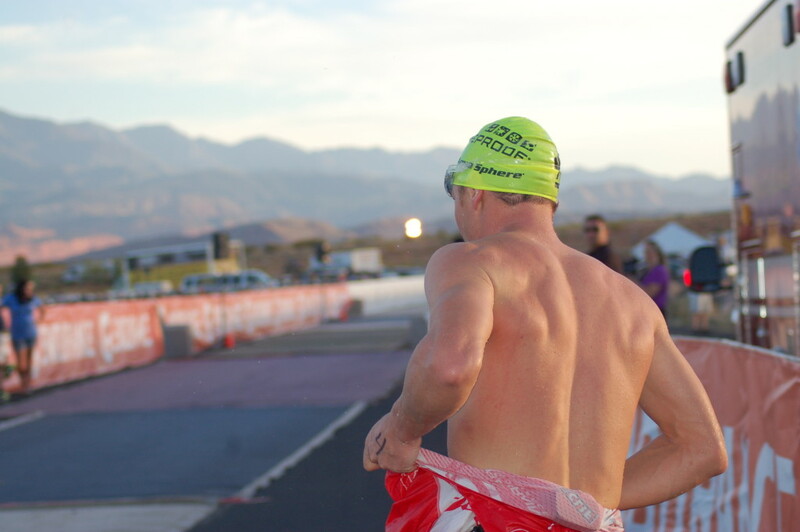 Age group triathletes were grouped in waves and marked by colored swim caps. 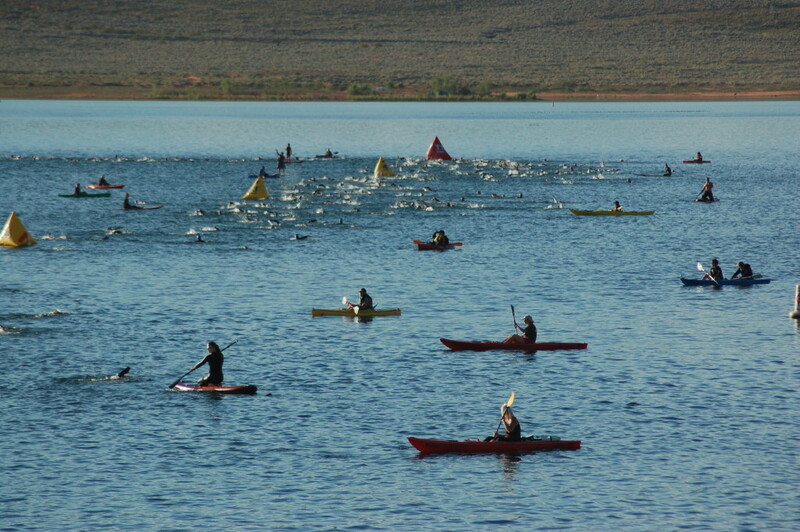 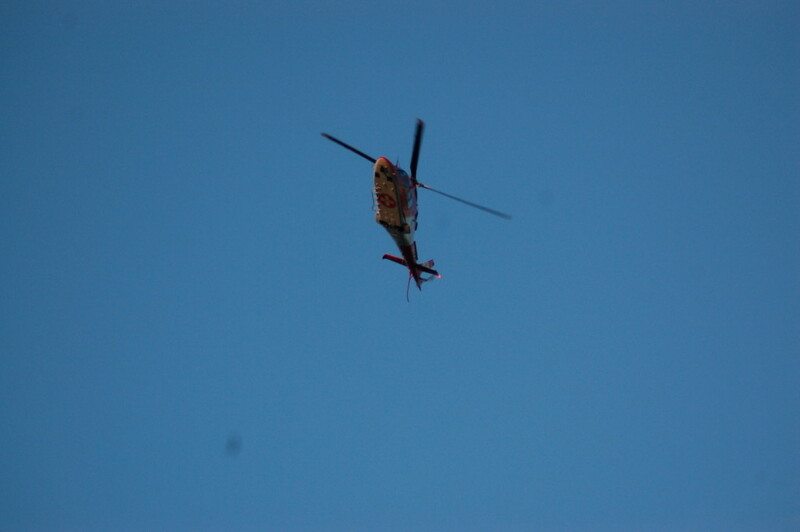 As the morning progressed each wave was led down the starting chute to the water. 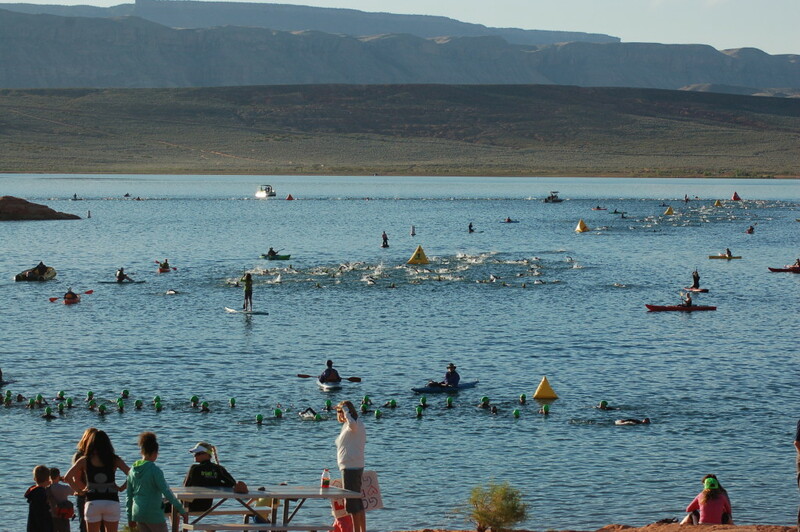 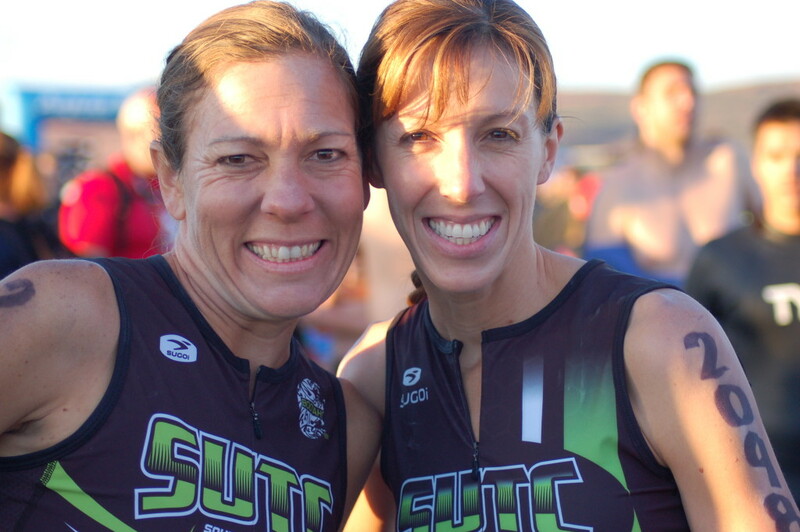 The first wave of professional males started at approximately 6:55 a.m. and the final age group wave was sent off at 8 a.m.
Age group triathlete, Katie Kyme, of Sydney, Australia, praised Southern Utah both for its beauty and the support the community gives during the race. 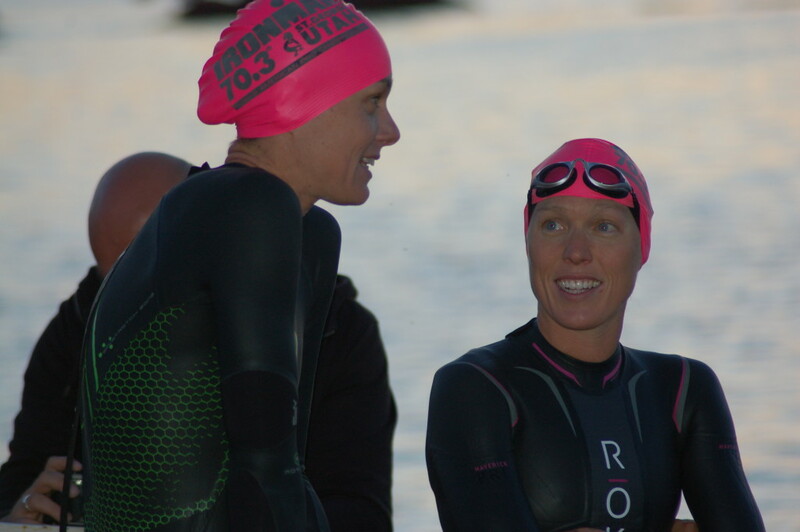 Kyme was also impressed with the level of competition the race offers, she said. 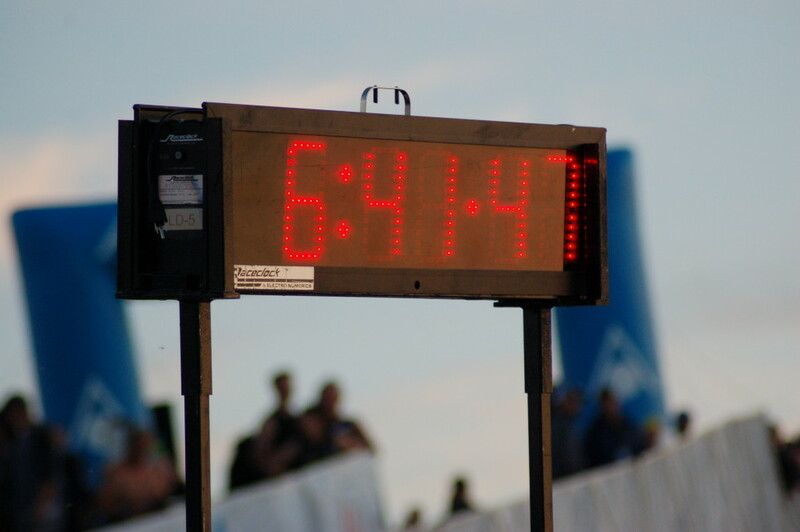 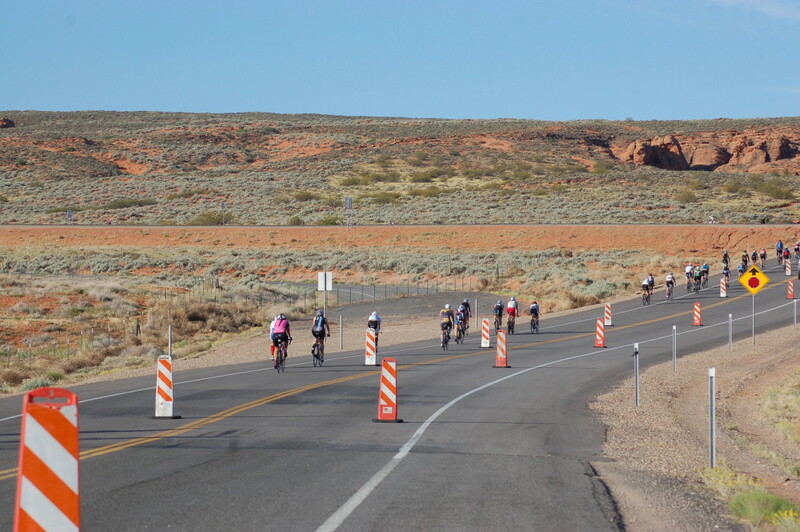 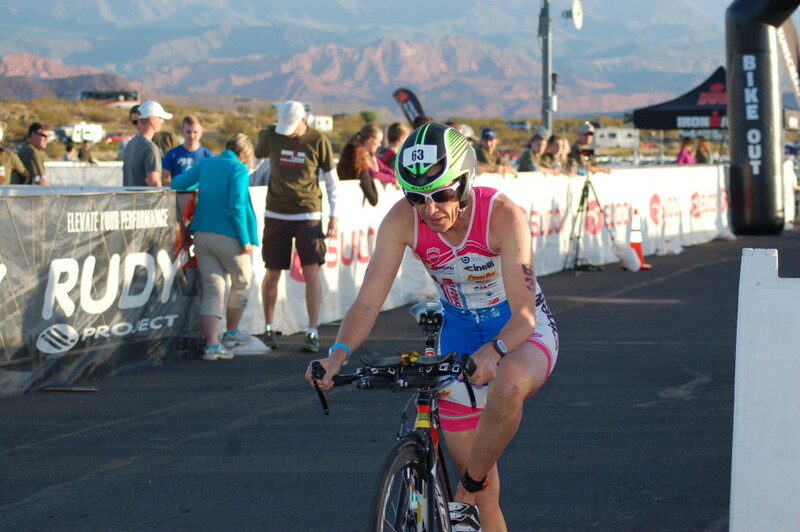 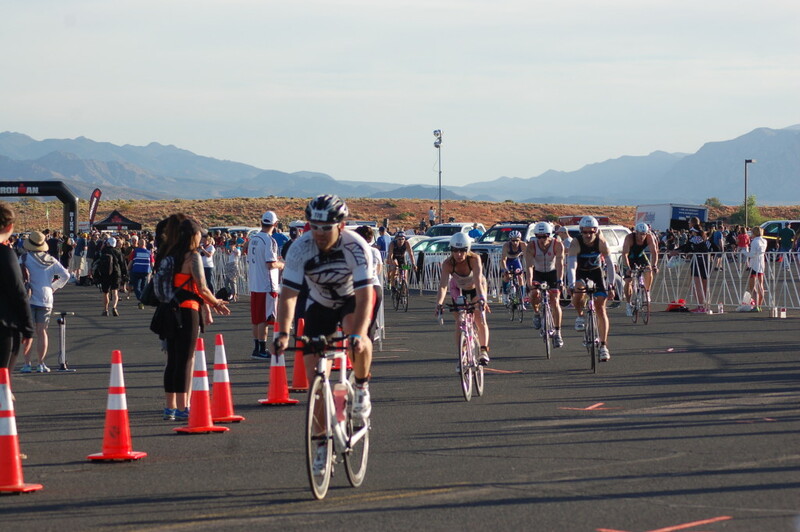 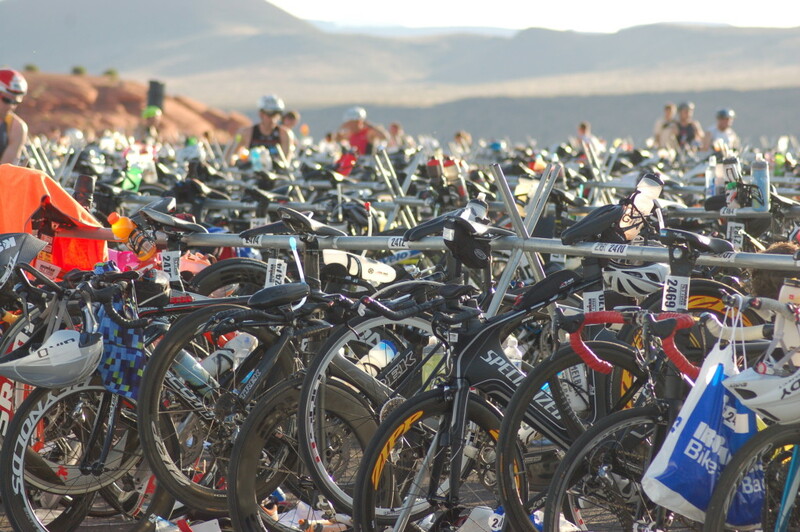 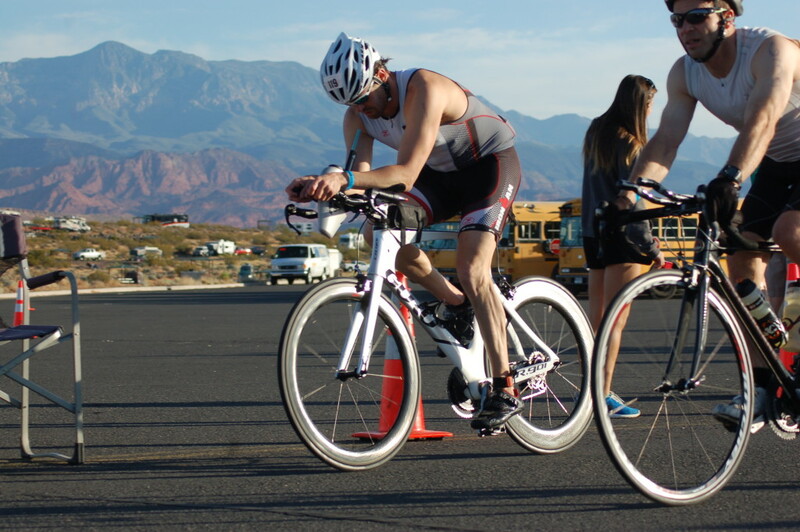 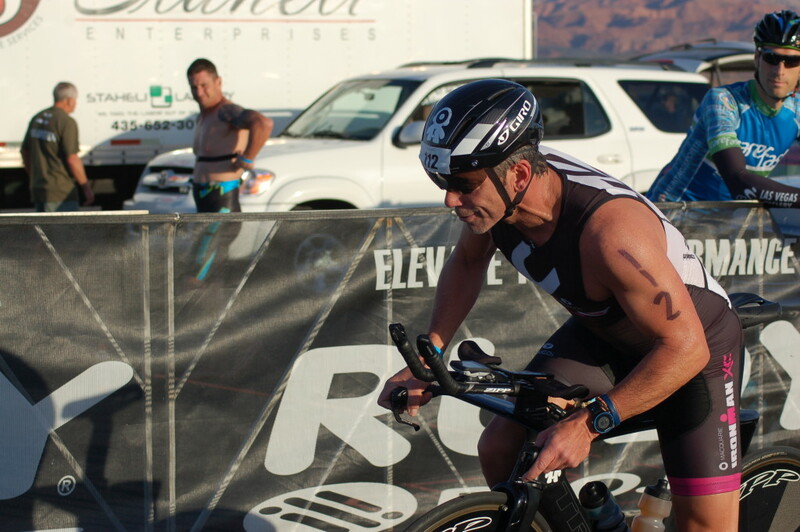 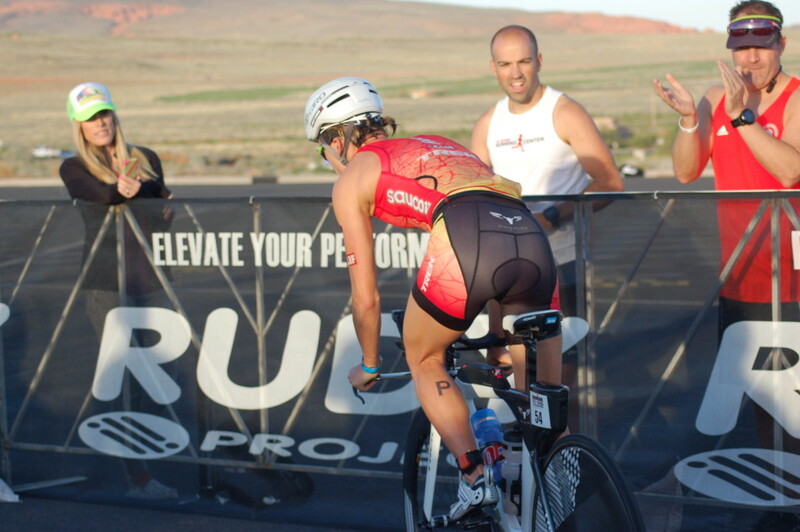 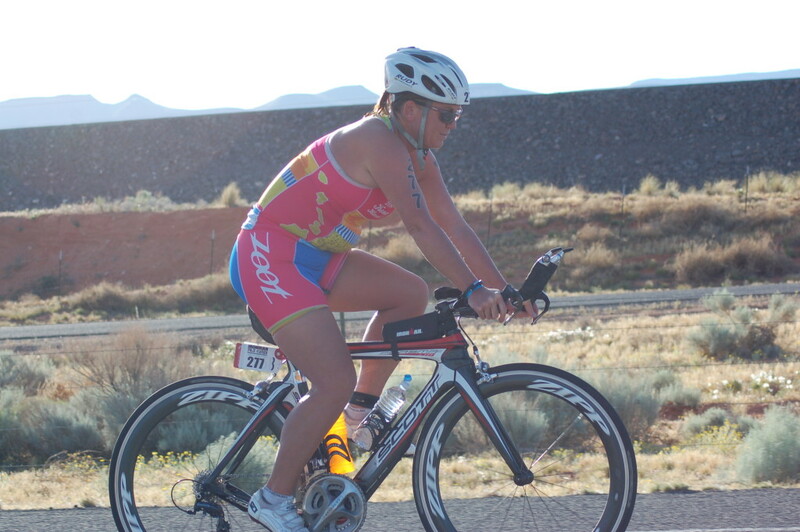 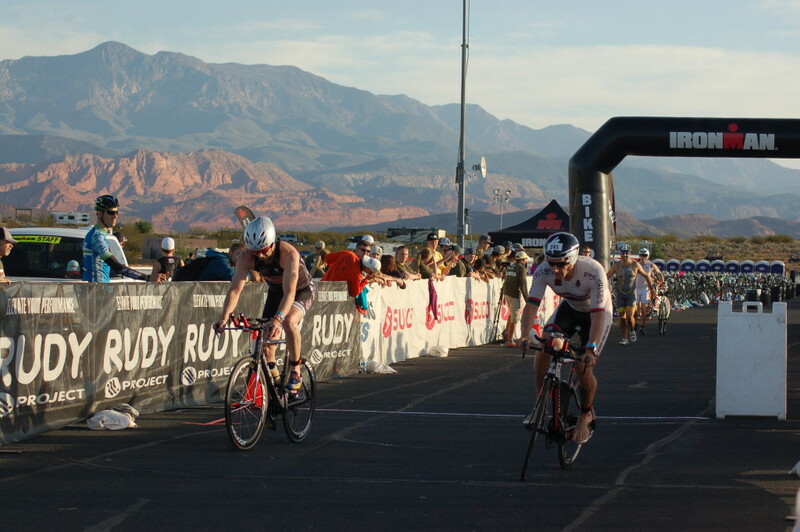 The Ironman 70.3 St. George is the site of the North American Pro Championship and attracts professional triahletes from all over the world who come to tackle southern Utah’s challenging course.